Difficulty Notes: Normally an easy scramble with tons of extremely loose scree, I did it with snow which made it more of an alpine adventure. A long stretch of exposed “no-slip” zones with snow. But I’m getting ahead of myself a bit. 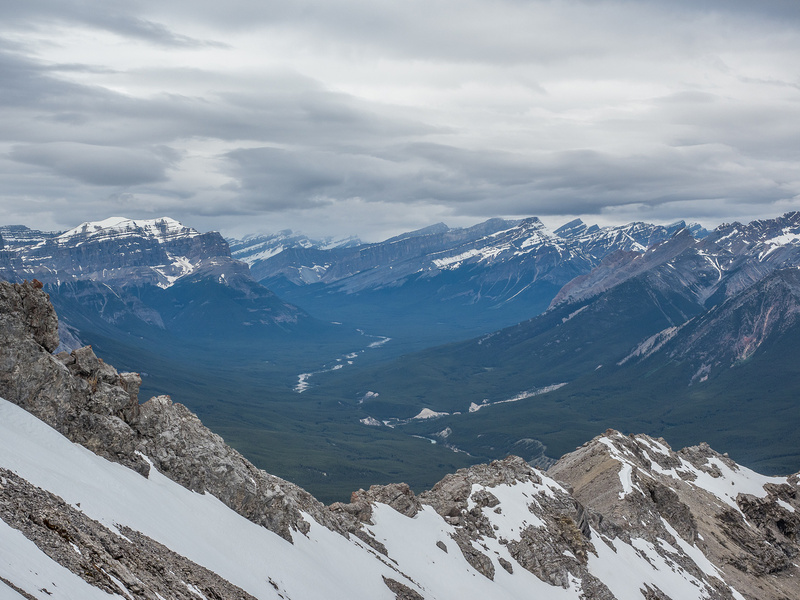 I had lots of time the afternoon before, after successfully scrambling Whirlpool Ridge, to think about objectives for my third and final day in DTC. I really wanted to try some of the Ex Coelis group but wasn’t sure I was in the mood for solo difficult scrambling. I also wasn’t sure about the weather fx, since I didn’t have cell reception. I finally settled on trying Elliott and Sentinel which interested me after talking to Mike about his trip in August of 2015. 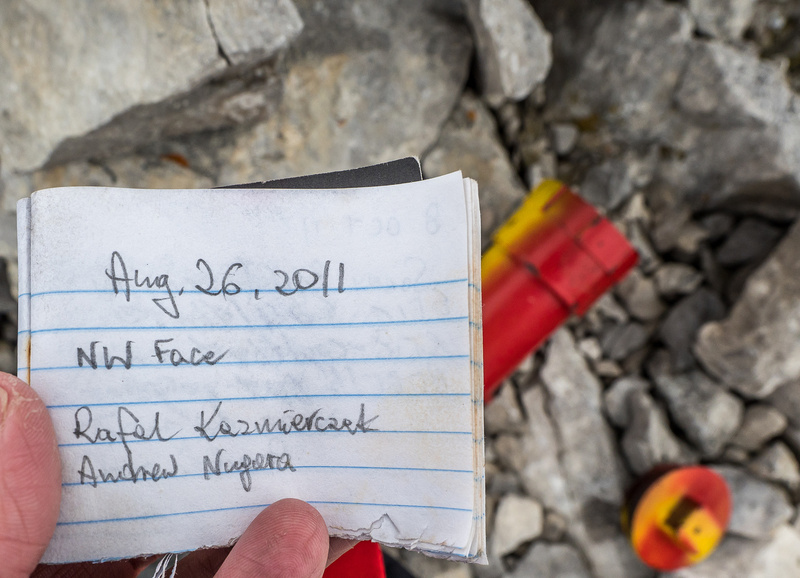 There were no published scramble routes up Elliott before Raf and Andrew finally found one on their descent of the mountain in August of 2011 after a very long and difficult ‘scramble’ up a slabby gully on it’s west face. 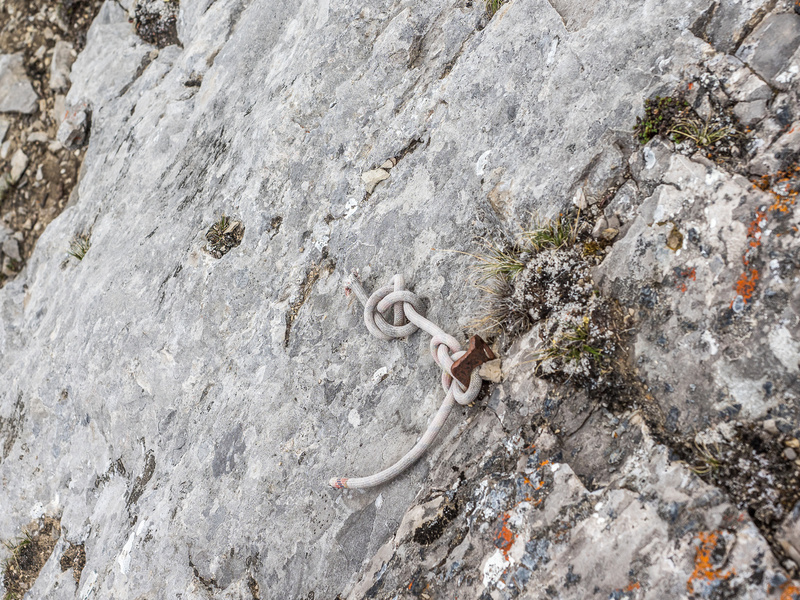 An old Bivouac report talks about a steep couloir route on the west face that was used by the Edmonton ACC section in May 2001 to ascend the peak, but this route sounds like more of a snow climb than a scramble and has some significant objective hazards as well. More people had tried the easy scree ramp route over the years and by the time I was interested in it, there was a pretty established route for intrepid scramblers. I had a trip report from Sonny Bou saved on my phone and used it to plan my day. I had to make the difficult decision to once again wear my uncomfortably heavy boots. The day before, on Whirlpool Ridge I should have worn my light scrambling shoes but elected to be cautious about snow and carried crampons and an ax all day without using them. For Elliott, I knew there would be significant snow and was actually counting on it to help lesson the brutal scree slog that this peak is known for. Geoff Hardy’s only comment to me about it, when I asked him, was that it was a “scree slog”. 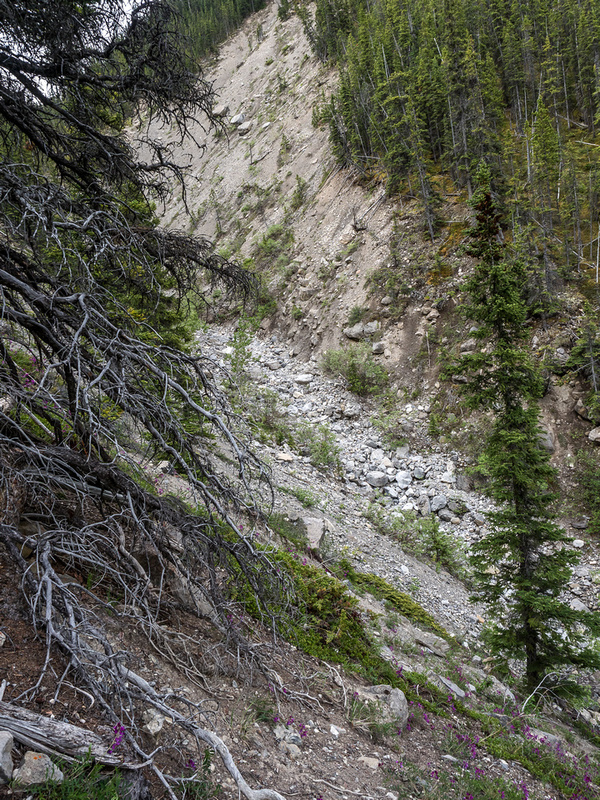 Sonny also mentions a lot of scree, and Mike had a story about a “scree avalanche” – which was not encouraging either. 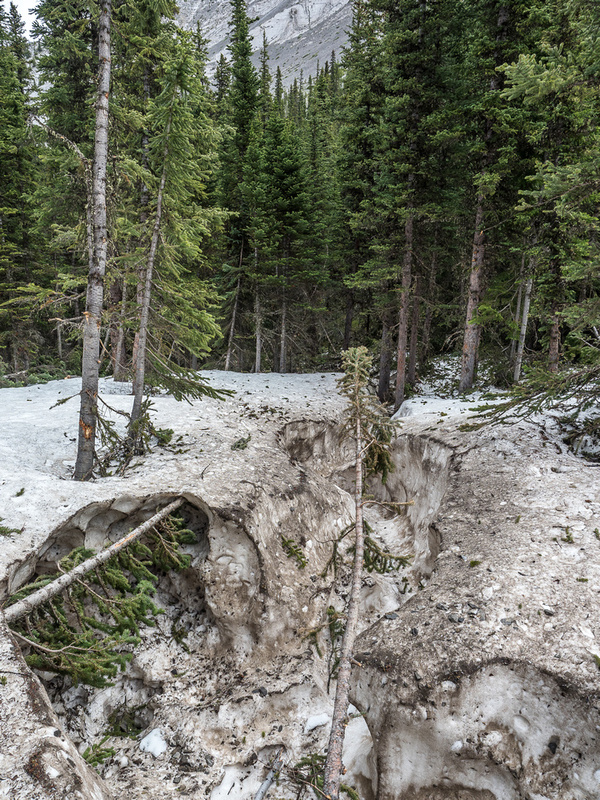 I knew that the scree ramp would still be covered in snow. It’s north facing and there was still plenty of snow on north slopes in the area, including the north bowl of Whirlpool Ridge a few days previous. 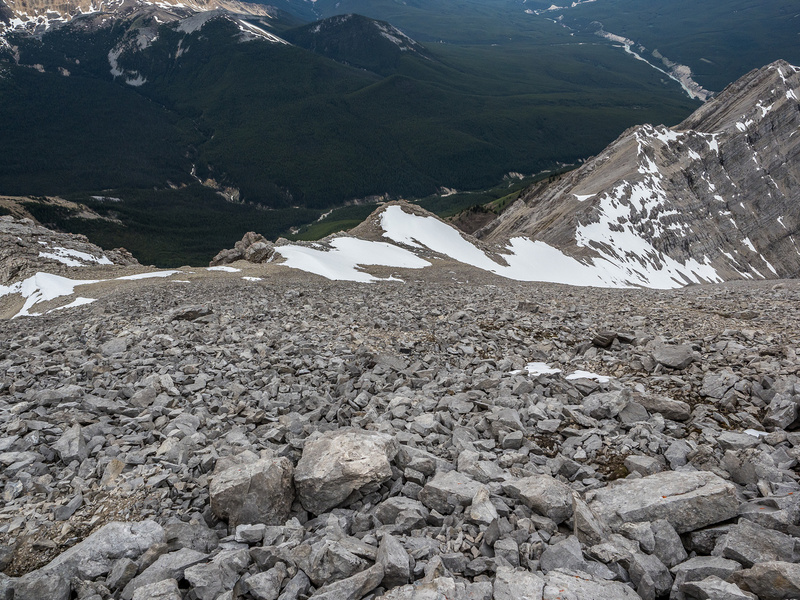 I also hoped the lower approach up the bowl to the scree ledge would have snow – which would greatly assist both the ascent and descent of the mountain. Monday morning I awoke at 04:00 and after consuming some Starbucks and a tasty muffin, I drove to the Cline River trailhead and parked with 4 or 5 other vehicles in an overgrown gravel pit near the start of the approach trail. After hiking for about 30 minutes along the very wide and well traveled Cline River trail I came to the O.D. Creek (unofficial) bridge crossing. I had some refreshing water before backtracking about 30m to a ridge running along the east side of the running creek. I had Mike’s GPS track which mostly avoided any bushwhacking and was very glad to use it considering some of what I’d read other’s putting up with on this approach! I realized as I hiked up along the creek that I’d probably somewhat underestimated this “easy” mountain. I do that sometimes, especially when I think a route is going to be very straightforward, which Elliott’s approach definitely is. 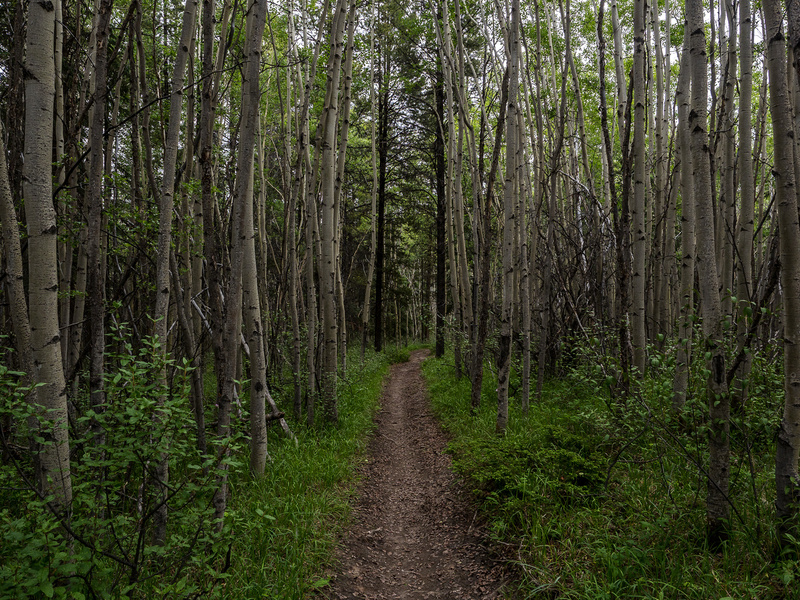 Even though it was very straightforward, it started feeling remote and big as I hiked through the amazingly open forest. Looking up O.D. Creek towards sunrise on Sentinel. I’d backtrack from here about 30m before paralleling the creek on climber’s left. Solo trips are much different than group ones. With a group you often are distracted from the idea of being alone in the wild, where almost anything can go wrong very quickly. Obviously, I love solo scrambling and hiking, but every once in a while I do ask myself what the heck I’m doing in these places all by my lonesome. 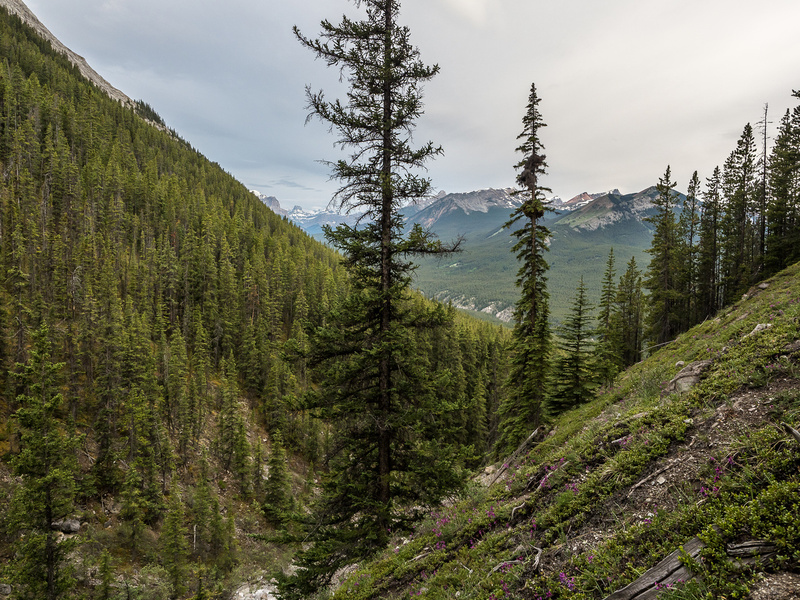 What made Elliott feel more remote than some of the other trips I’ve done is the almost complete lack of a trail – especially when compared to other peaks and ridges in the area. There was a very faint trail along a ridge on the east side of O.D. Creek but very little other signs of use. Put it this way – I knew as soon as I started up through the forest that I wasn’t going to be running into anyone else for the rest of my day. O.D. 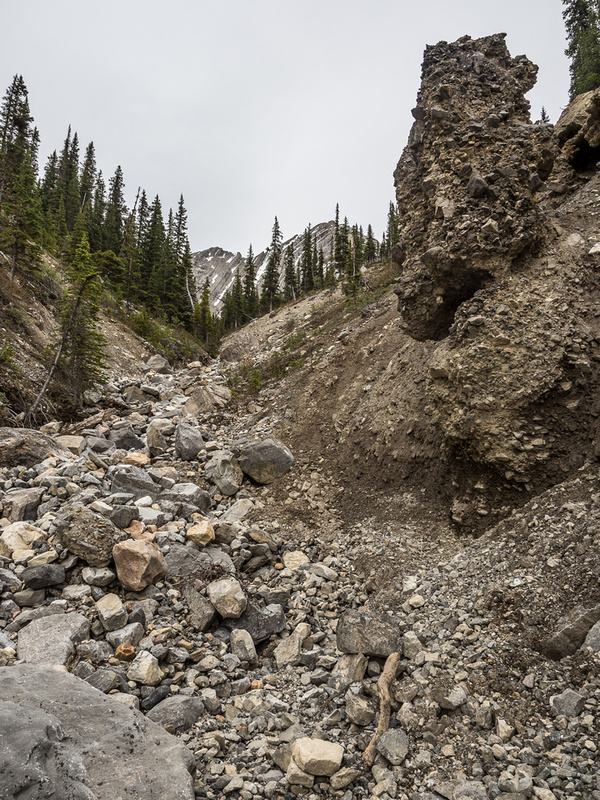 Creek itself was not navigable thanks to copious amounts of water flowing down it and tons of debris from avalanches and water. The forest was a pure delight to hike through at 05:30 in the morning. Birds were chirping all around me and there was no wind whatsoever. Despite the clouds, the weather was perfect for hiking – cool but not cold. There was zero bushwhacking despite the lack of a good trail. This section of DTC gets very little moisture apparently. After coming across a few fire rings and an old lean to pole shelter in the forest, I realized from looking at the map and my GPS that I had to make a descent towards a fork of O.D. Creek below me to my right (west). On the map, the east branch of the creek (climber’s left) looks much longer than the right hand one, so you’d expect it to be the larger of the two. You’d be wrong. As I approached the fork I noted that the reason the GPS track descends into the left branch is that it’s only at this point that it’s completely dry! The right one was still roaring down towards the Cline River at this point and completely un-navigable thanks to avalanche detritus and the level of water in it. Note the hard, smooth limestone on my left and the loose, unstable rock on my right. 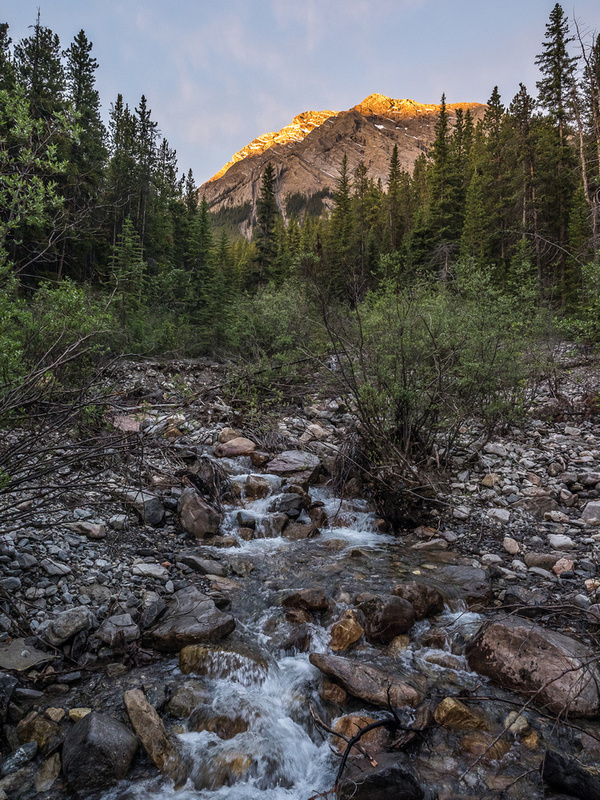 I was quickly becoming more and more enamored with Elliott Peak as I started up the left hand branch of the creek. This route was getting interesting! I marveled at how nice it was for Andrew and Raf (not to mention all the others who refined it afterwards) to discover and share this route – it didn’t come easy, as many of them spent time bushwhacking up wrong drainages and navigating choked up stream beds in pursuit of an optimal path which I was now enjoying immensely. 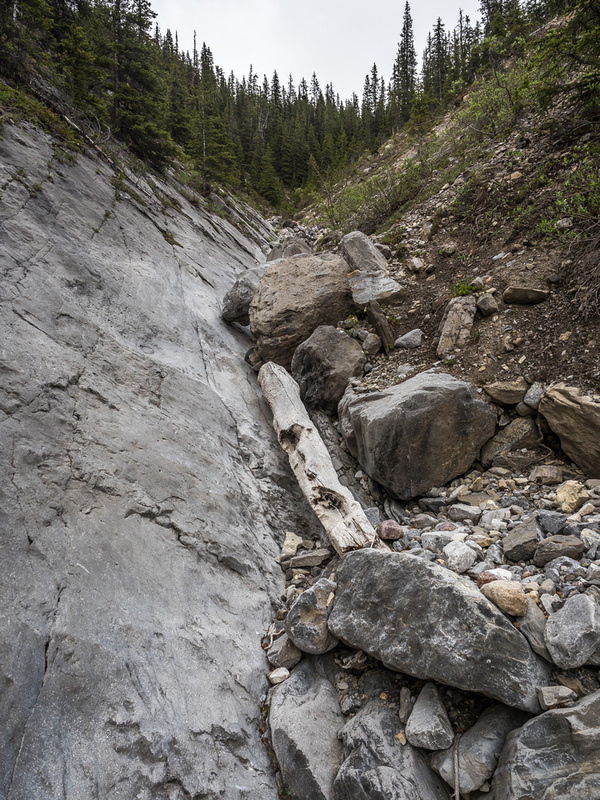 One thing I noticed almost immediately upon gaining the creek bed was how precariously the right hand bank was balanced between sticking where it was and collapsing into the creek bed with the next heavy rain storm. 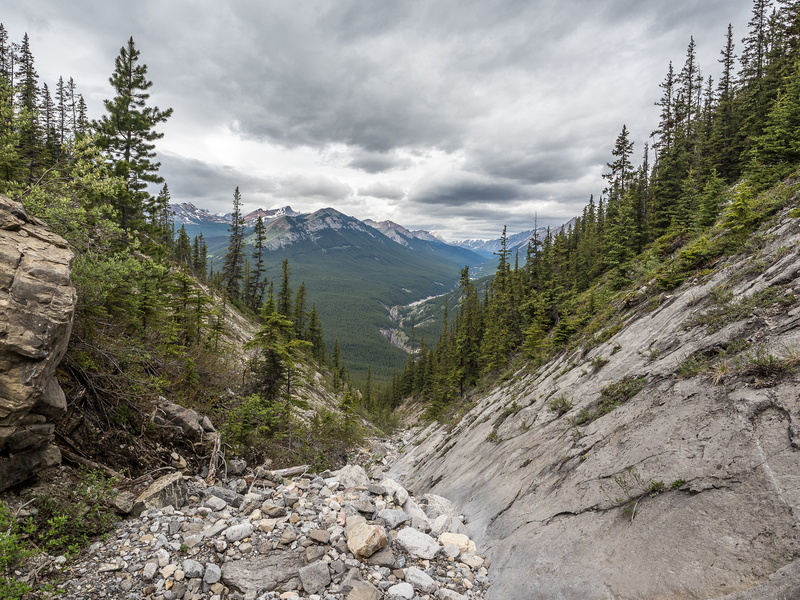 I nervously kept glancing up to my right as I made my way along a hard limestone wall on one side and concrete scree and boulders on the other. The creek widened a bit before things got interesting again. 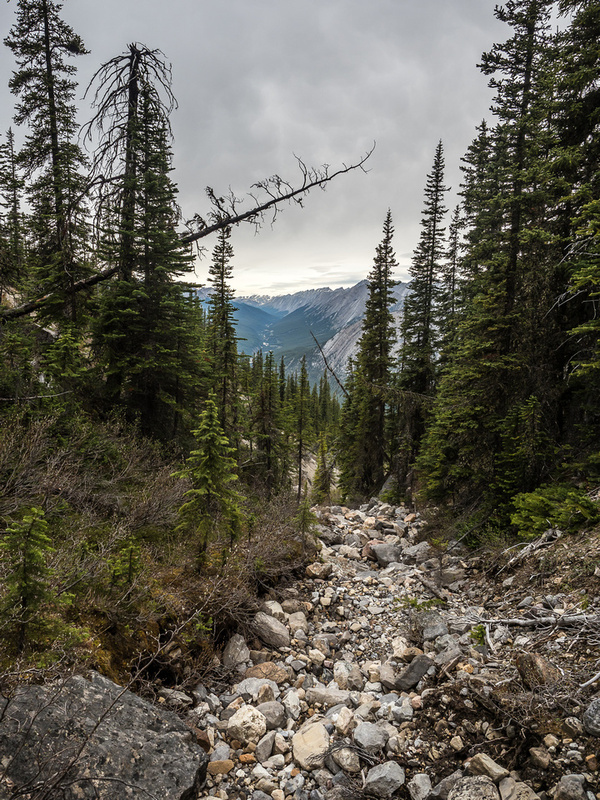 I found myself traversing hard avalanche debris which is sure to make traveling up the creek nightmarish for a short section once all the snow melts and the deadfall contained within the slide chokes up the creek. I had it easy as I simply walked up the hard snow and stepped over any detritus that happened to be sticking out of the surface of it. The slide looked to be a rare event by the size of the trees it took down (30+ years?). As I approached the drainage where the slide originated, the creek took another left branch and I bid the debris field goodbye. My travel up the creek became more and more interesting the higher I went. Once again, the right hand banks of the creek were incredibly unstable and looked ready to come down on me at any moment. There was even a tower of concrete scree balanced precariously on the bank at one point. I could see Elliott Peak looming in the distance and even though I knew it had to be very foreshortened, I started feeling like I was getting somewhere. A very dangerous feeling so early in the day! Eventually the creek looked to be ending in dark forest ahead of me. I knew it must continue, but where? And how? Once again, I was in for a bit of a surprise. 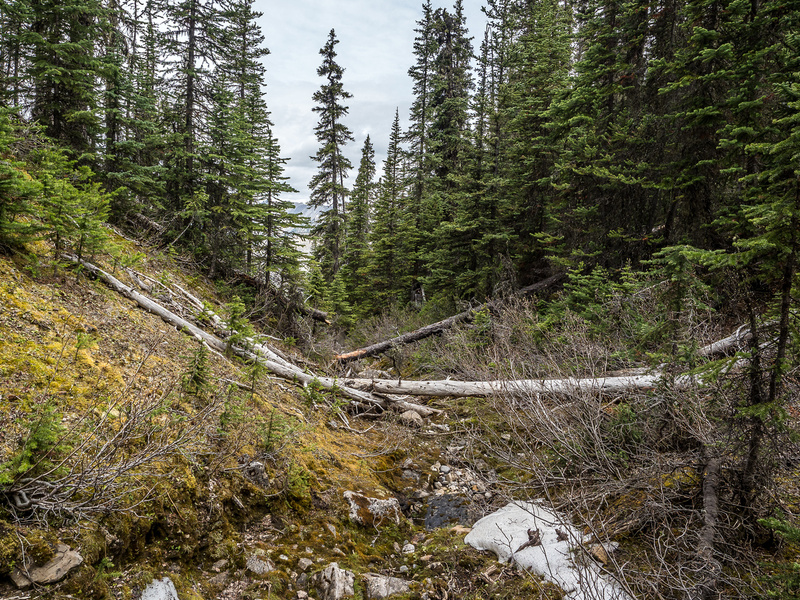 The creek went from a ‘normal’, rocky, bouldery creek bed to a tightly forested, mossy, somewhat overgrown one within about 10 meters! It was such an abrupt change, it totally caught me by surprise. The rocky stream abruptly becomes a beautiful mossy, lush forested one. I didn’t see that coming. 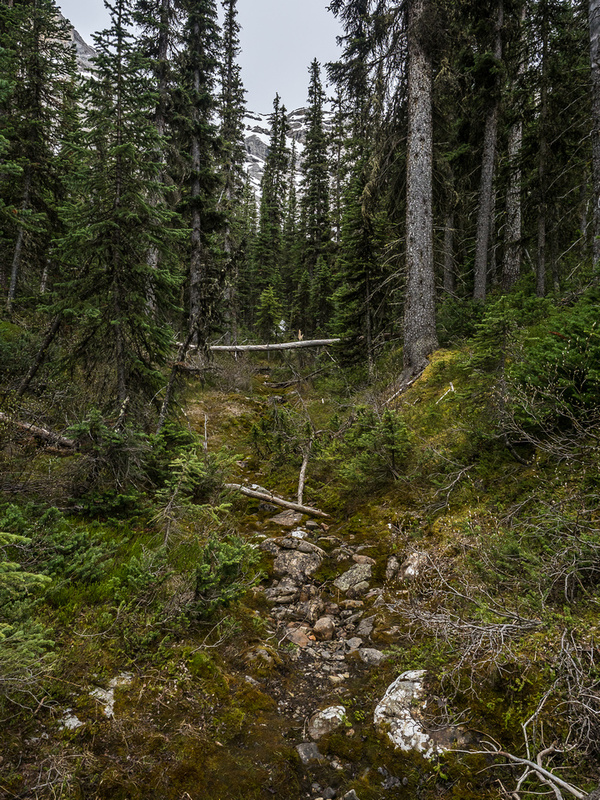 I followed the mossy, wet stream as it curved towards the alpine bowl between Sentinel and Elliott through thickening forest. 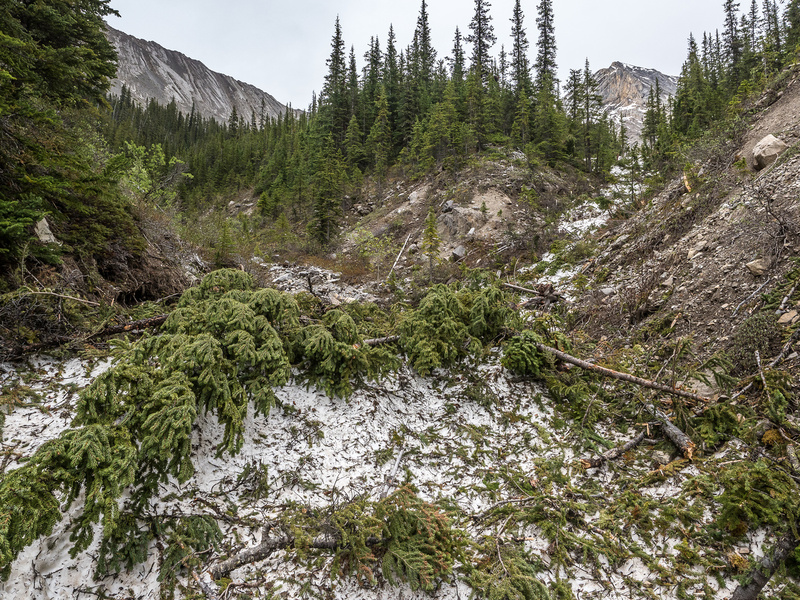 Just when I suspected that I might be in for a bit of a bushwhack after all, I ran into another avalanche debris field. Once again, all the debris was still embedded in a massive amount of hard snow, making my traverse of it much more pleasant than folks who come up later in the season once the snow melts. I saw a large cairn on the edge of a boulder field and followed it and my nose into the alpine bowl, finally breaking treeline and getting my first clear glimpse of the rest of the route to the summit. Gaining height rapidly on the lower snow / avalanche slope. Look at all that nasty scree I’m avoiding! I’m smiling at this point but also nervously looking up at the exposure off the snow / scree ramp high above. Note the steep gullies at center and left. I was both delighted a bit shocked to see all the snow that awaited me on the remaining 800 vertical meters to the summit. 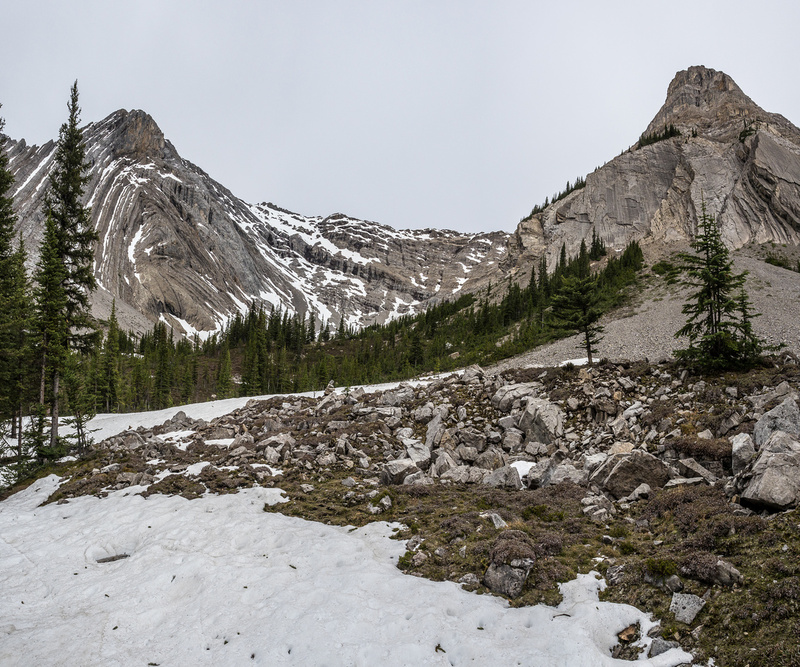 I wanted snow, in order to avoid all the nasty scree that Elliott is known for, but I wasn’t sure if I wanted as much of the white stuff as I was seeing! 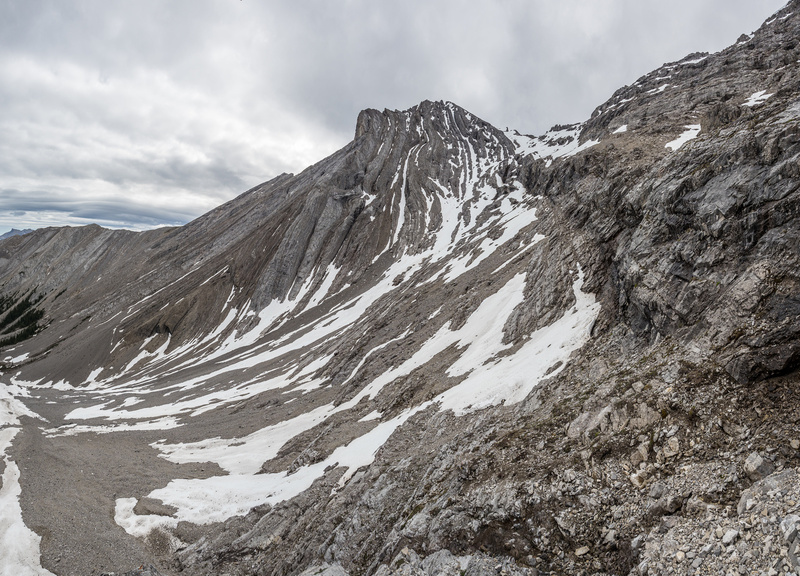 The route looked fairly easy from below, but I knew that the cliff band running under the scree traverse (which was now snow) would be very exposed, especially if the snow wasn’t stable. A slip or an avalanche would surely kill if it happened up there. I walked to the edge of the snow field (avalanche) and started up on firm snow. I almost needed my crampons in spots, but managed to get all the way up to some running water just under the break through the cliff band that allows access to the scree bench. This is another section of very interesting terrain. Such an innocent little break makes this peak so much easier for scramblers than any of the crazy NW gullies that other folks have used in the past. 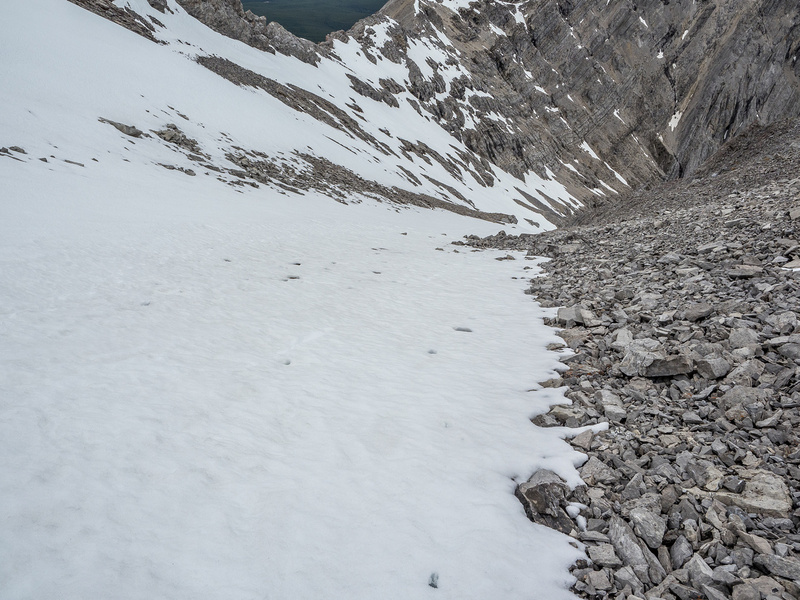 As I breached the scree bench, I realized that my day was going to be quite a bit different than I had expected and I was not going to benefit from the ‘easy’ bench with all the snow that was still covering it. I honestly wasn’t sure if my day was even going to continue as I put on my crampons and took out my alpine ax. Time for crampons and ax. And some bravery. This view is not representative of the exposure once I got onto the slopes – which is exactly why I went on them in the first place. 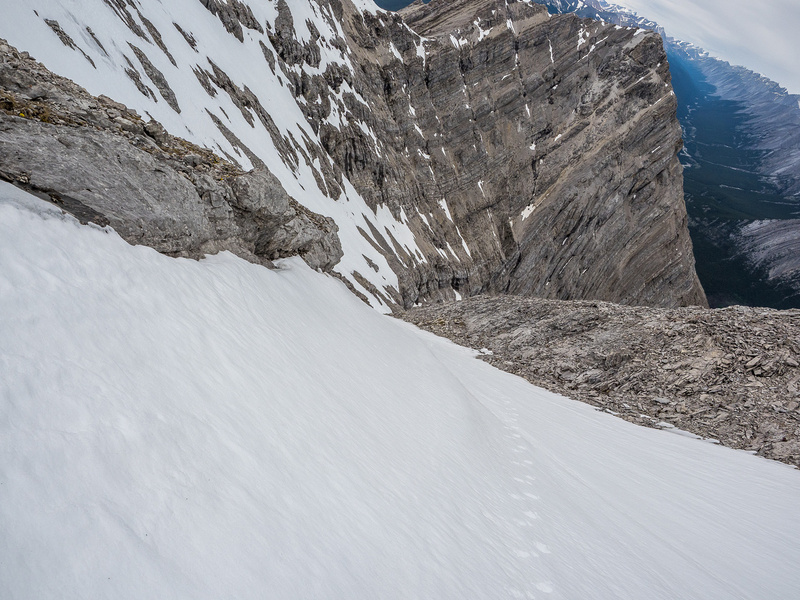 As so often happens in the mountains, things that look difficult can prove to be quite simply once you get your nose into them, and things that look extremely simple and straightforward can prove to be annoyingly difficult once your nose is half way up them. The scree / snow ramp on Elliott was the latter. From the lower scree covered bench section, the snow ahead actually made me whoop out loud with anticipation. It looked so much better than a long scree trudge. Sure! I knew that I still had over 500m of elevation gain ahead of me, but it looked easy and fast – especially if the snow was as supportive as the lower avalanche slopes had been. My celebratory mood was a wee bit premature. 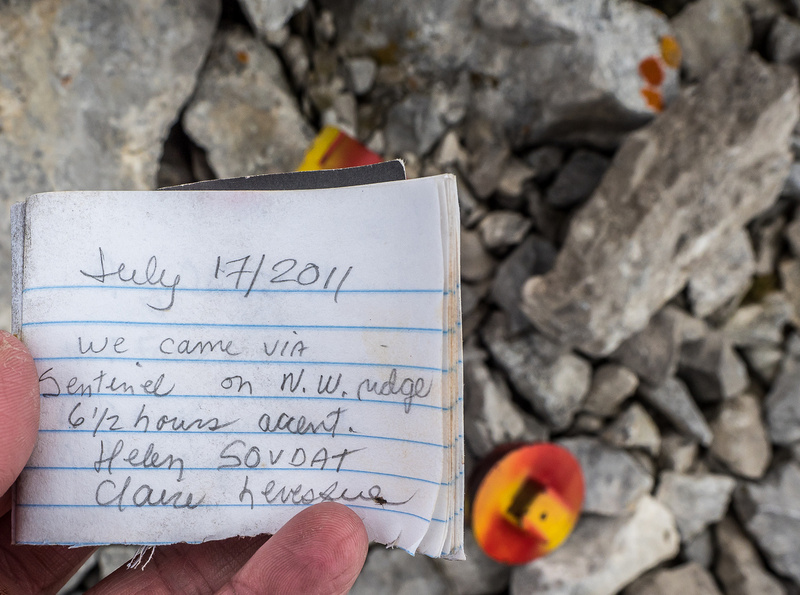 As soon as I got onto the first snow patch along the scree bench I realized that my day wasn’t going to be quite as easy and straightforward as I’d thought about 5 minutes previous. The snow reminded me of the slush-fest on King Edward that turned me back on my second attempt of that peak only weeks earlier. Thank goodness I was under a cloudy sky or I’m sure I would have turned back already at the very first snow patch on the ledges. As it was, I made it across half way and looked down nervously. I was shocked at the exposure down the cliffs below! On scree this is nothing more than a hike, but on crusty, punchy, slushy snow, it felt very touchy and exposed. 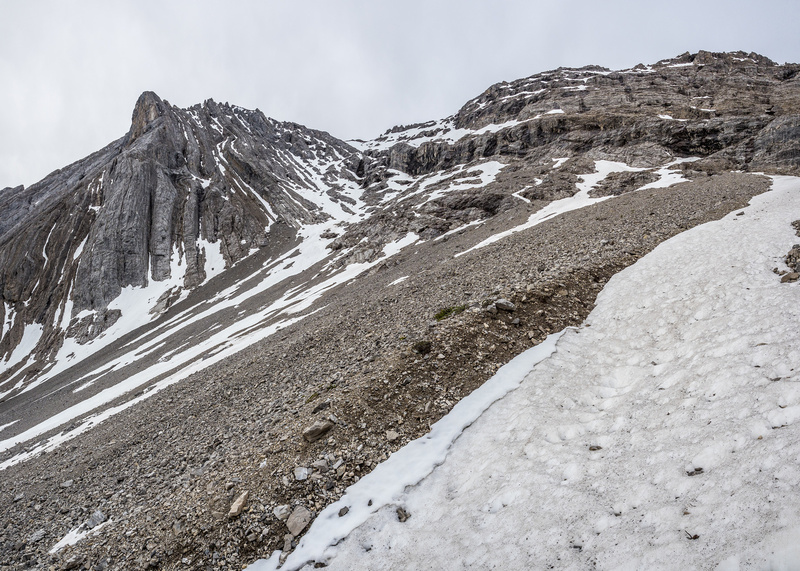 Obviously the snow slopes along the scree ramp are plenty steep enough to slide – there was evidence of this all along the traverse. There was also the possibility of wet sloughing or simply tripping on the punchy crust and sliding over the cliffs immediately below me. I have no photos of the first 4 or 5 snow field crossings simply because I was in a hurry to make it across them. At one point I tried traversing higher against the upper cliffs but that was a very bad idea thanks to the increased exposure and bad snow. I even turned back at one point, considering that it just wasn’t worth the risk anymore. Finally I realized that the least exposed part of the slopes was near the bottom where I would only be exposed to slide dangers for a few moments. The issue? The bottom of the slope was obviously thin and there was even bits of ice under a slushy layer that wanted to slough me over the hungry cliffs just below! I managed to skirt around the edges of some of the slopes before getting into the final large, but thankfully much more stable, snow gully leading up to the final scree grunt to the summit. 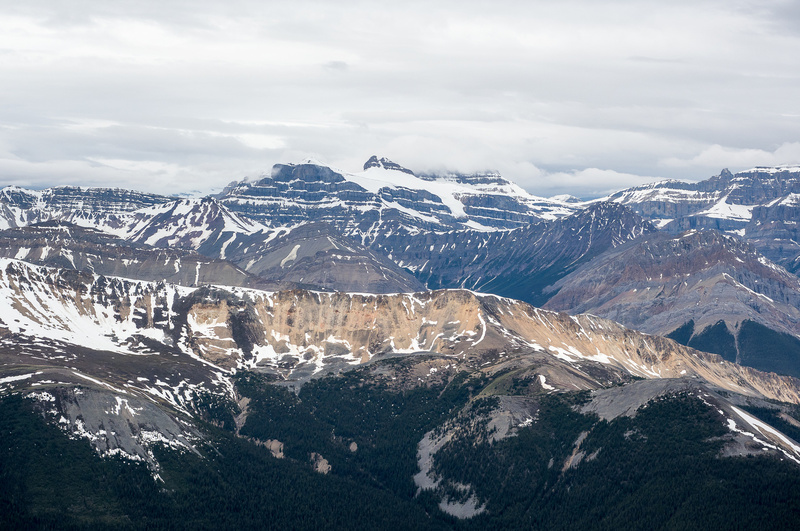 Tele pano with Two O’Clock Peak and Whirlpool Ridge at right and Siffleur, Peskett and Loudon in the clouds at center. The last snow slope was much bigger than it looked – like all the terrain above the alpine bowl on this summit! Once I finally reached the end of the snow section, I was still surprised by the amount of height gain to the summit on a loose, bouldery slope. By the time I finally popped out at the top of Elliott Peak I was tired and not looking forward to descending all the tricky snow that was waiting for me below. Thankfully the views were awesome, despite the cloud cover – but I certainly couldn’t risk the clouds burning off and the snow slopes getting exposed to direct sunlight. There was no safe way to bag Sentinel on this trip. Oh well. It was significantly lower anyway and I was happy to have Elliott on its own. 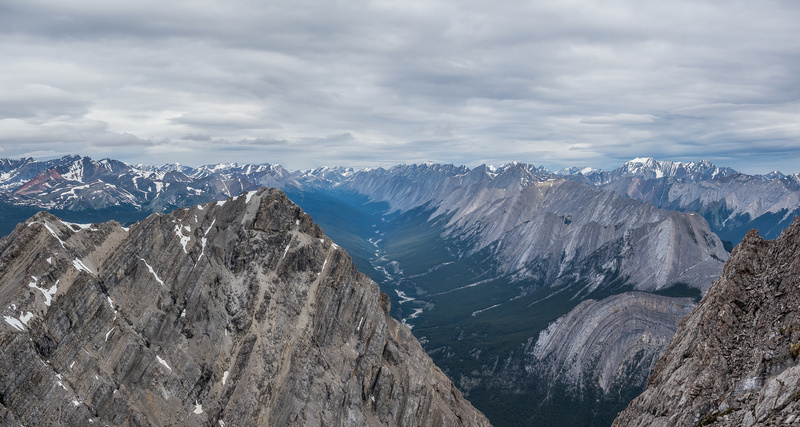 pectacular views down Abraham Lake (R) and Coral Creek (L) and Whitegoat Creek (C) with Bright Star, Stelfox, Vision Quest, Allstones, Abraham and Michener (L to R) visible. pectacular views up Coral Creek along Stelfox / Bright Star (R). There are a bunch of strange and unfamiliar peaks on the distant right including Cloud Buster, Dark Storm and Fence Post, which are all over 3000m high. Once I started down, I maintained an aggressive pace to get back over the exposed snow slopes before they turned to knee-deep mush. I almost made it. 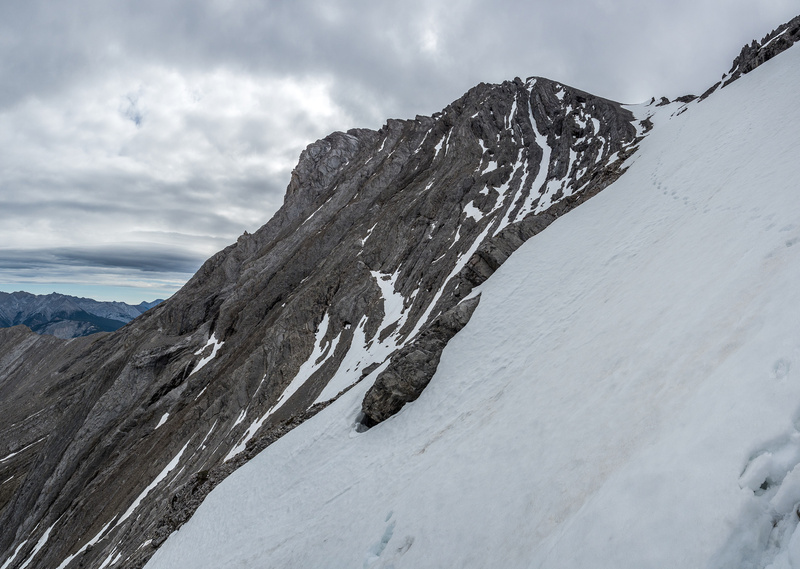 There were sections on the ledge that had me tip-toeing down in my crampons, wishing the shallow crust to hold my weight only to plunge knee to waist deep in spots. There’s nothing like trying to ignore the run-out of a questionable snow slope while you delicately step across it – willing it in your mind to hold you long enough to cross to the other side. Once I was off the snow I whooped with relief and slowed down a bit to enjoy the rest of my exit along the fabulous creek and forest to the main trail. The lower-angled and less exposed avalanche down the scree bowl went very quickly and the creek also went faster than I thought it would. Once I was back in the forest it was a pleasant ramble back to the truck before a long drive home. Almost done the ledge traverse (L), looking over the O.D. Creek approach valley past Sentinel Peak (L). This section was kind of cool with hard smooth limestone slab at right and loose sediments being washed down from the upper left against the immovable slabs. I am surprised to be writing that I really enjoyed Elliott Peak. I know a lot of folks don’t appreciate the last half of the mountain thanks to copious amounts of relentless scree, but as a scrambler if you don’t like scree than I have to ask why you’re not an alpine or rock climber instead? 🙂 A scrambler not liking scree is like a fisherman not liking water or a hunter not liking meat. It’s strange. That being said, I avoided much (most?) of the scree on Elliott so in this case I might be underselling how hard the scree sections really are. 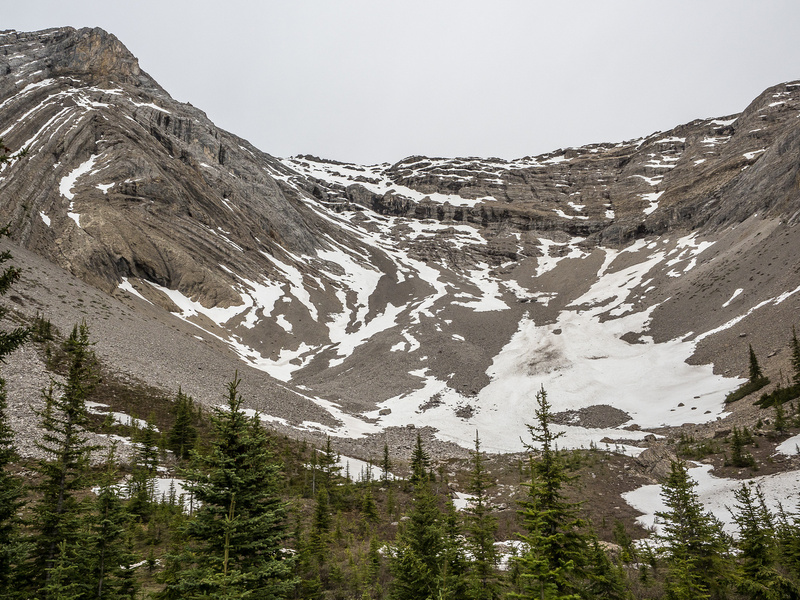 I can tell you this – unless you’re a comfortable alpine climber on steep exposed snow slopes, I would avoid this one until at least late July or even August. 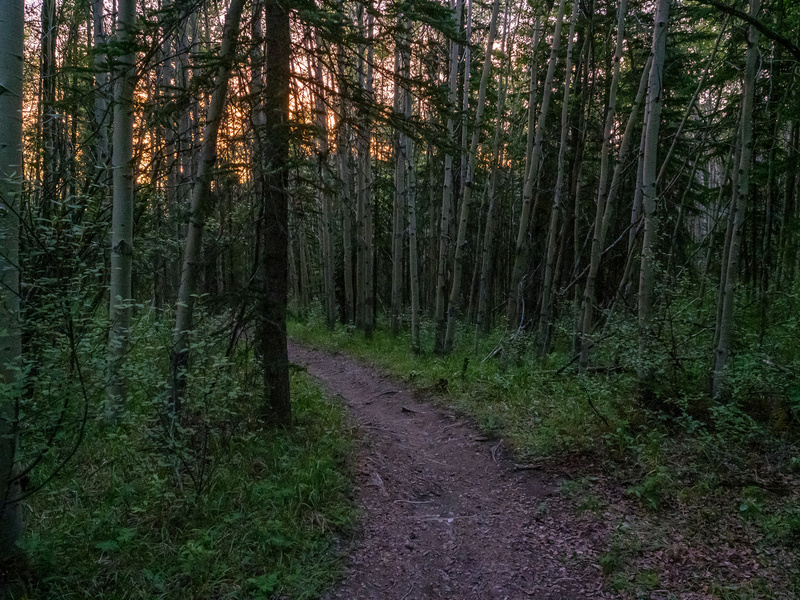 A lovely 05:00 morning hike in the forest along the Cline River Trail. Looking up O.D. Creek towards sunrise on Sentinel. I'd backtrack from here about 30m before paralleling the creek on climber's left. 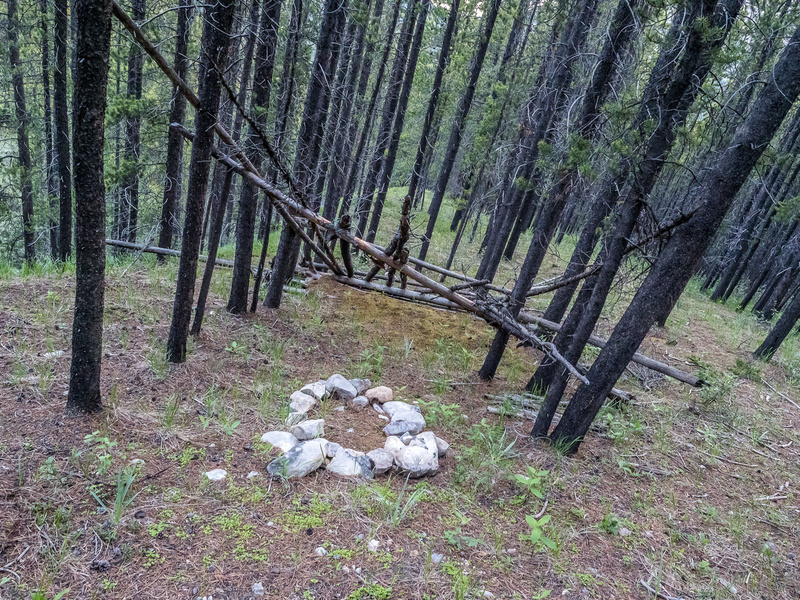 An interesting lean-to with fire ring part way up the ridge. Gaining height along O.D. Creek, looking back along the tight confines of O.D. and up Coral Creek in the distance. A steep, loose descent from the pleasant forested ridge down into O.D. Creek east fork, which is dry at this point. Elliott Peak looks much closer than it is in this shot from the creekbed. This was easy travel for me, but is going to be a PITA for folks once all the snow melts. The slide came in from the right (clearing a very straight line through the forest) but my stream branches left and I will leave this mess behind. A very unstable tower of concrete scree is just waiting to fall on an unsuspecting traveler. Looking back down a very narrow and small creek now. The rocky stream abruptly becomes a beautiful mossy, lush forested one. I didn't see that coming. The cairn at the edge of the boulder field just visible at center and the open terrain leading to the alpine bowl ahead. Sentinel towers at right and Elliott at left. This view is extremely foreshortened - there is at least 800m of elevation gain left at this point. Gaining height rapidly on the lower snow / avalanche slope. Look at all that nasty scree I'm avoiding! 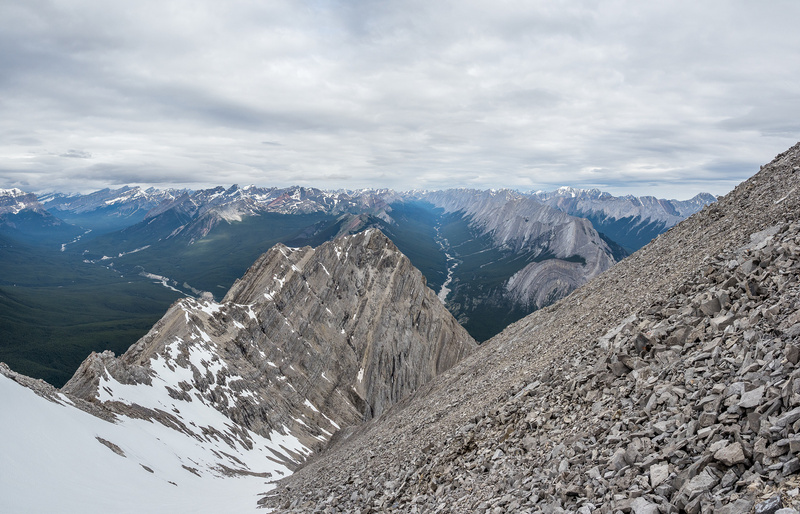 An extremely foreshortened and deceptively easy-looking view along the scree / snow ramp to the summit of Elliott Peak. Finally in a more stable snow gully leading up to the final scree slope to the summit. This is what my exposure was like on the easy angled part of that slope. 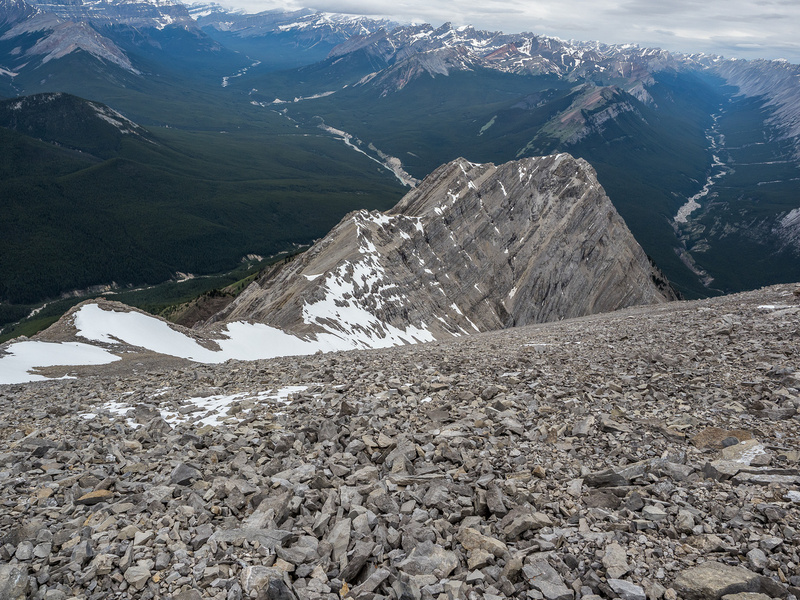 Distance makes everything look easy again as I look down from the scree / boulder slope to the summit. Familiar names in the summit - this must have been a strong team. Another strong team! They published the easy descent route that became the scrambler's route up Elliott and Sentinel. (L to R), William Booth, Ex Coelis, Ernest Ross, Tuff Puff, Whirlpool, Bridge, Two O'Clock, Landslide and Resolute / Cline in the far distant right. 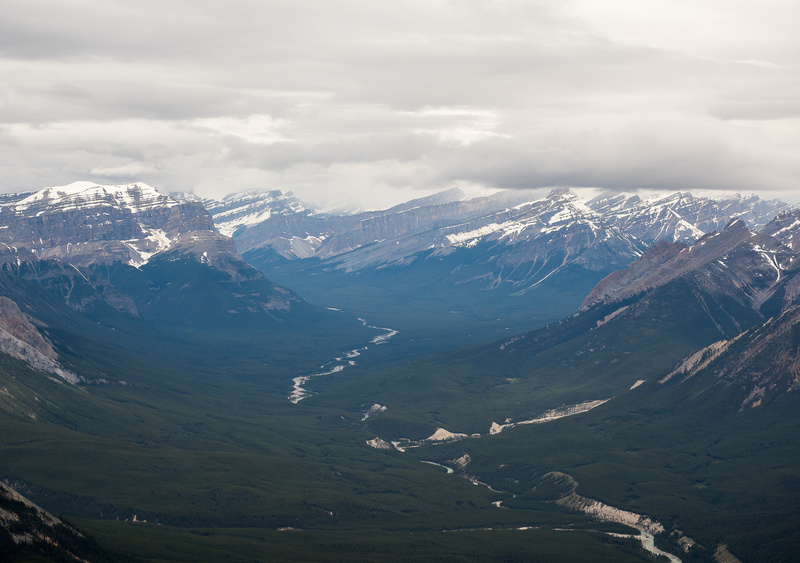 Gazing far down the Coral Creek Valley to the NW. Telephoto towards Resolute and Cline (in the clouds). 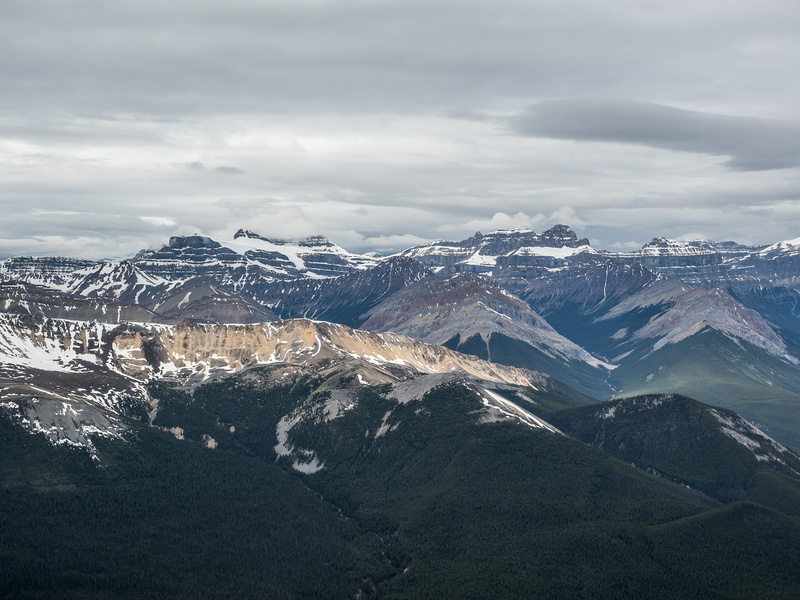 Tele pano with Two O'Clock Peak and Whirlpool Ridge at right and Siffleur, Peskett and Loudon in the clouds at center. Looking up Whiterabbit Creek past the Ex Coelis Group at center. 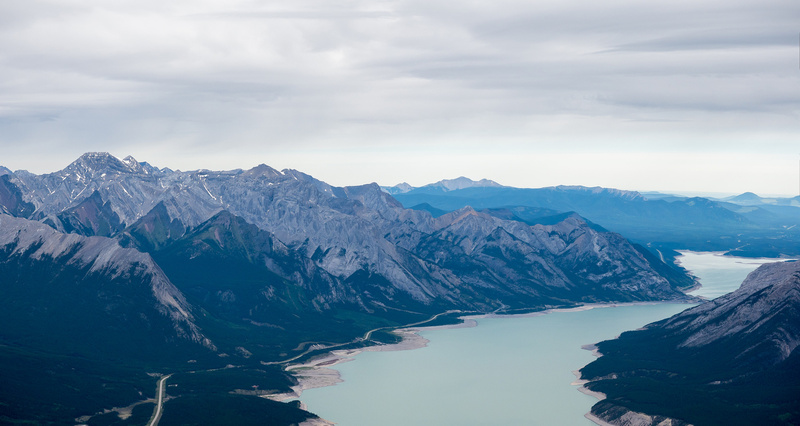 Abraham Lake (R) and Coral Creek (L) and Whitegoat Creek (C) with Bright Star, Stelfox, Vision Quest, Allstones, Abraham and Michener (L to R) visible. 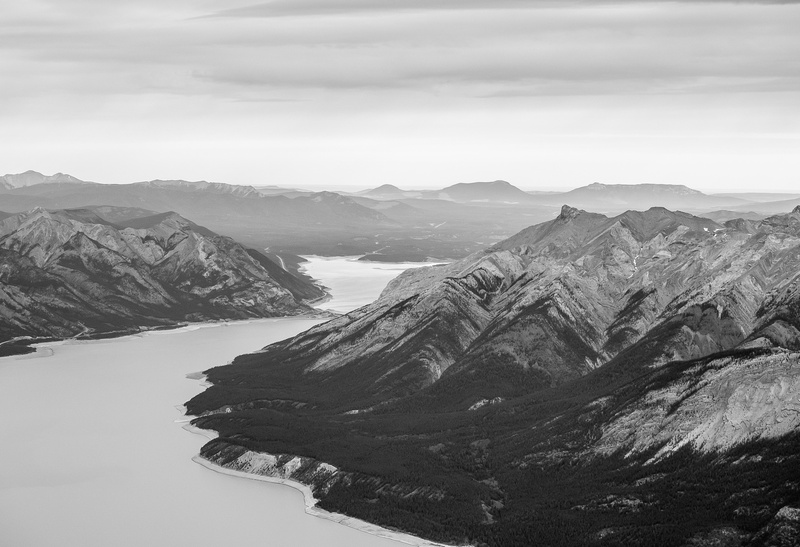 Looking over Mount Michener towards the end of Abraham Lake and the foothills beyond to the Bighorn Range. Allstones on the left and Abraham to it's right. Windy Point Ridge at center. 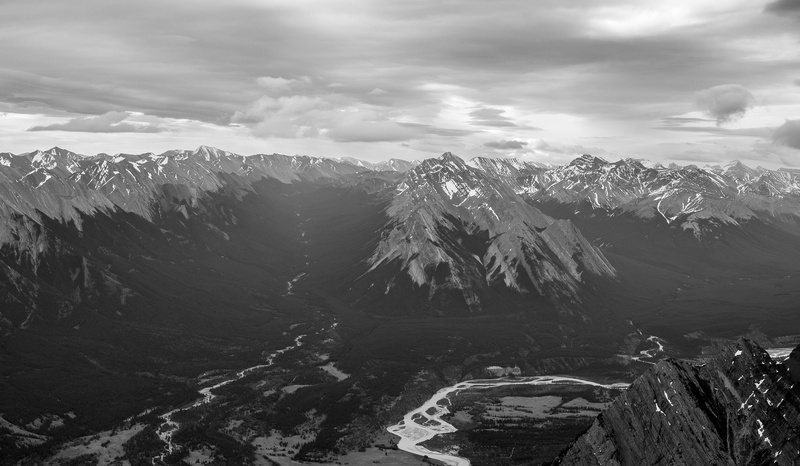 Spectacular views up Coral Creek along Stelfox / Bright Star (R). Starting my descent, looking at the ridge traverse to Sentinel Peak. Getting down the upper rubble slope, still looking down on Sentinel and the softening snow ramp. 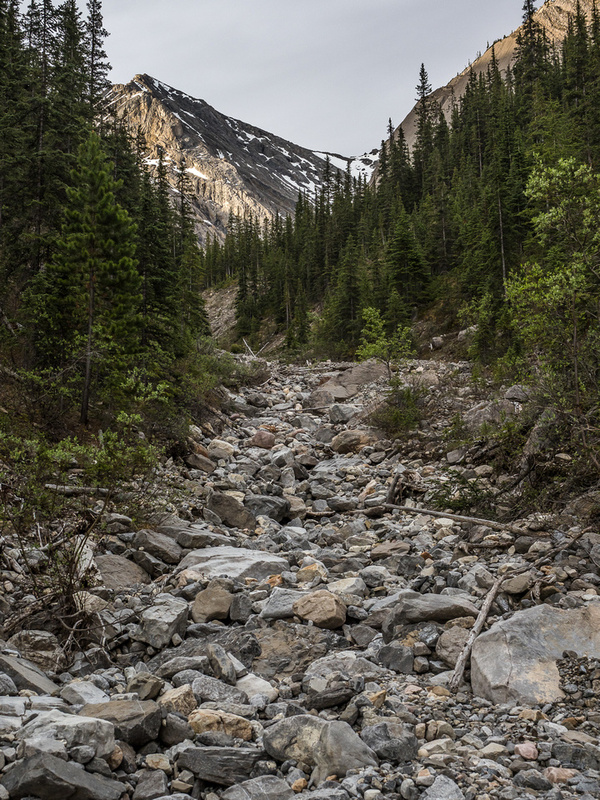 A view up the Cline River over the ridge leading to Sentinel Peak. Finally back on scree and heading down to the bowl at left. This pin was remarkably solid despite it's obvious age. 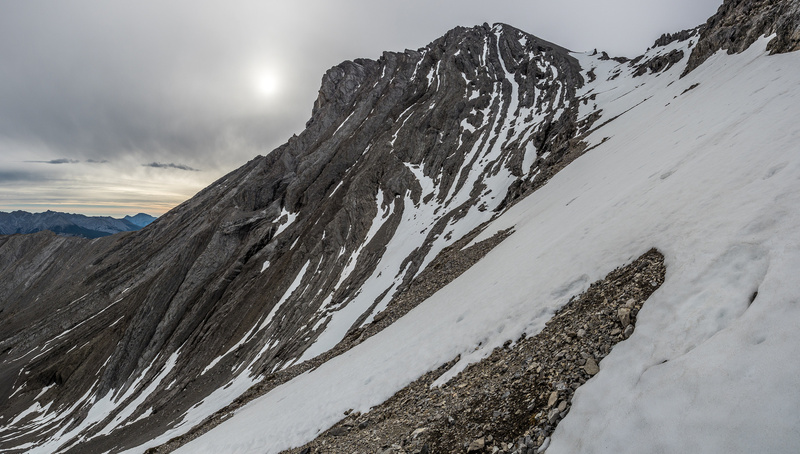 The moderate terrain that grants access from the bowl (L) to the scree ramp (R) with a good view along the cliffs that add exposure when on snow. 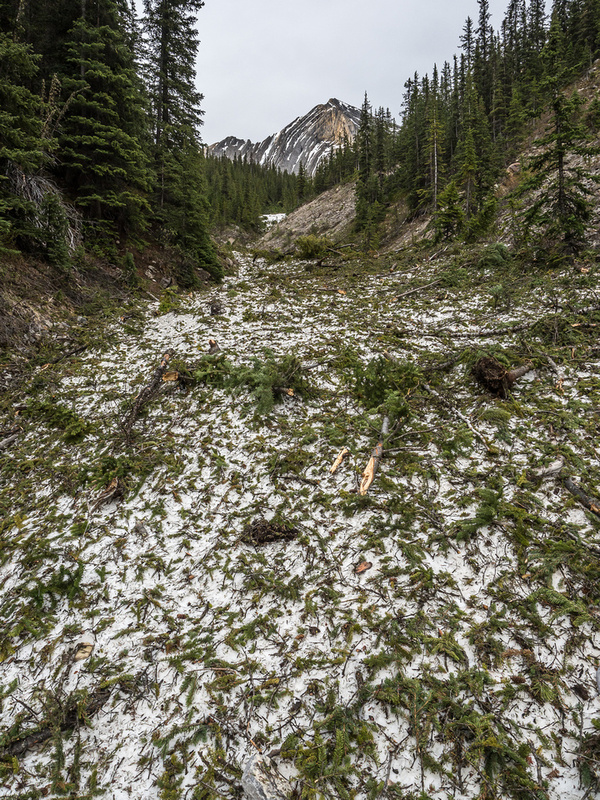 Interesting avalanche debris in the upper forest. 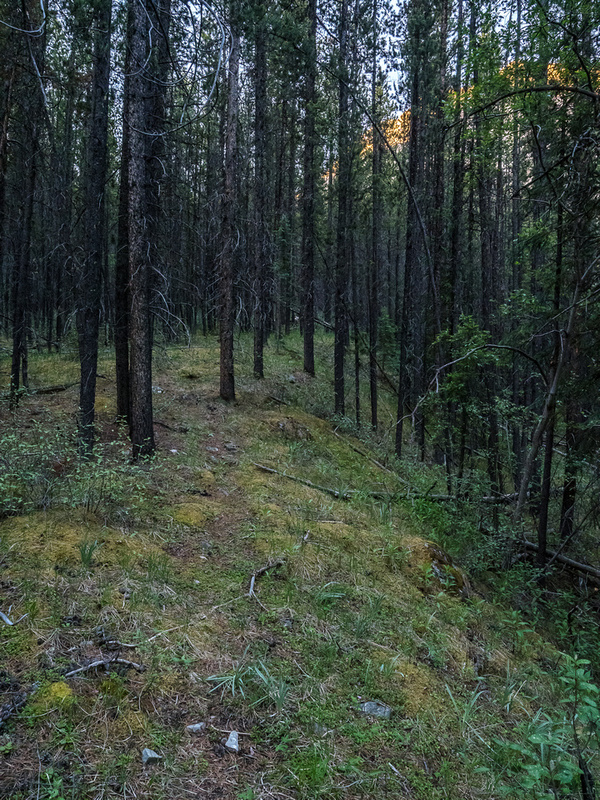 The odd forested section of the creek, just before breaking into the rocky drainage. Back in the forest. 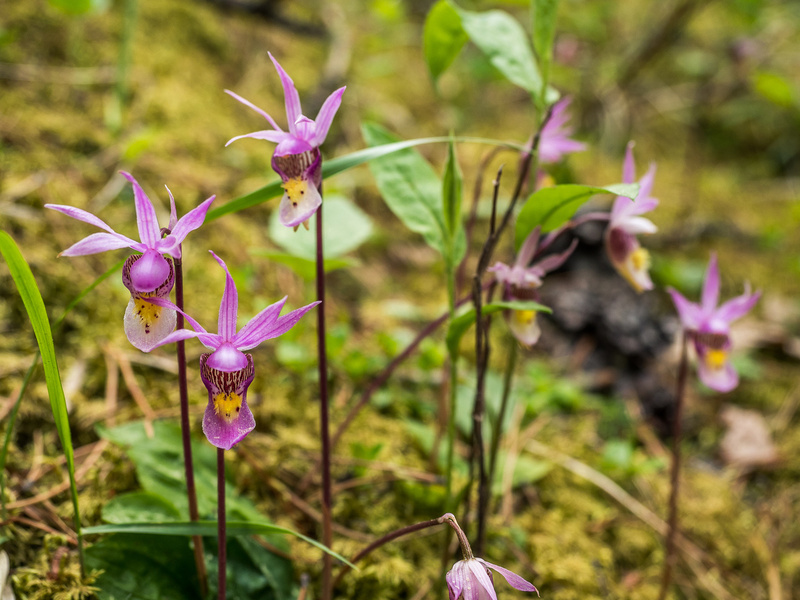 This seems to be the year of the Calypso Orchid - I'm seeing way more than usual. 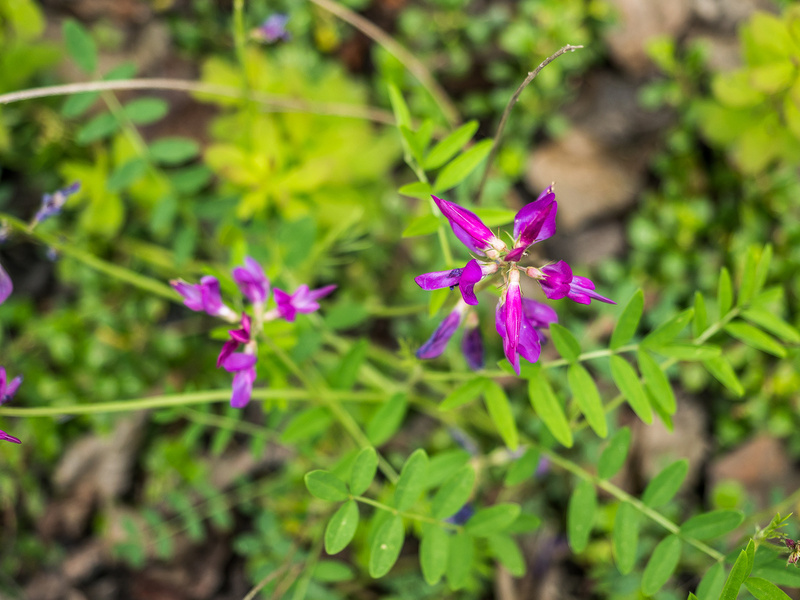 More color along the trail - this time it's the Larkspur. Back on the excellent Cline River hiking trail. 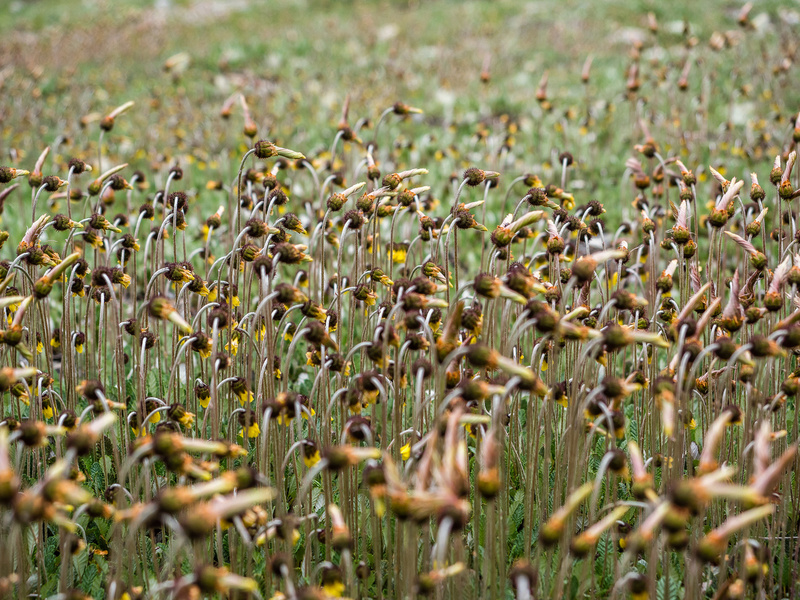 The Avens at the parking lot are just about gone to seed already. These suckers don't flower for very long!